"YouTube often has the Wikipedia effect. I visit for a specific reason and end up on a completely unrelated subject and never leave bread crumbs to find out how I got there. Well, today I was on YouTube watching some physics videos and ended up with a trip down memory lane with the X-Men cartoon intro. With the theme tune on loop in my head whilst working on an app, I was inspired to take a break from development and update my lock-screen wallpaper on my device. 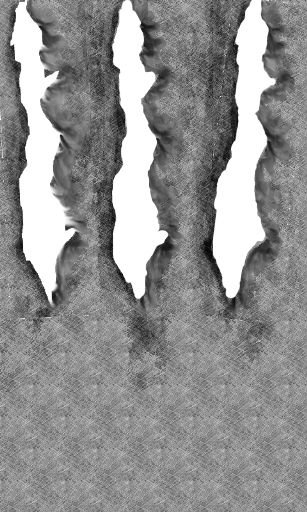 I had an idea of creating (Wolverine-inspired) claw marks as part of the lock screen. All the wallpapers I've seen for Windows Phone 7 contain no transparency. I thought it would be cool to be able to display the home screen ‘through' the claw marks." Imagine having that image above as your Windows Phone 7 Lock Screen image, and being able to see your start screen below where the "rips" are! Apparently it's do-able with the wonders of a PNG file with transparency. If you're not into the claw effect, this could be a great way to let you see just the information on your live tile without even having to unlock your phone! Quite cool! That's neat. Thinking of trying this with a Window (real window) wallpaper with the Home Screen showning through the panes. Funny about your Wikipedia excursion. I remember doing the same thing with actual encyclopedias as a kid. We had Britannica and World Book, and I would be looking something up for homework, something would catch my eye, which would lead to something else, etc. Often forgot what I as looking for in the first place. Haha, wow, that's really cool!